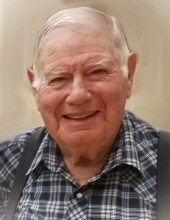 Robert LaVerne Jaminet, 87 years old, of Remsen, passed away on Sunday, November 11, 2018 at Mercy Medical Center in Sioux City, IA. Mass of Christian Burial will be 10:30 a.m. Friday, Nov. 16, 2018 at St. Mary’s Catholic Church in Remsen with Father William McCarthy officiating and Deacon Rick Roder assisting. Burial will follow in St. Mary’s Cemetery in Remsen, IA. Graveside military honors will be conducted by V.F.W. Post 3328 and American Legion Post 220 of Remsen. Visitation with family present will be 4-7 p.m. Thursday. There will be a rosary by the Knights of Columbus and Catholic Order of Foresters and vigil prayer service all at 5 p.m. at Fisch Funeral Home & Monument in Remsen. LaVerne was born Aug. 31, 1931, the son of John & Catherine (Ryan) Jaminet at Cherokee, IA. LaVerne was raised and educated near Remsen. He attended St. Mary’s High School, graduating in 1949. He then farmed and drove truck for his brother Ed. He entered the US Army in December of 1952 and served in Japan and Korea. He was discharged in 1954. On Nov. 16, 1955 he was united in marriage to Shirley Heuertz at St. Mary’s Catholic Church in Remsen. The couple farmed northeast of Remsen until 1997 when they moved into a condo in Remsen. LaVerne drove school bus for 32 years. LaVerne was a member of St. Mary’s Catholic Church, Knights of Columbus, Catholic Order of Foresters and he was one of the original V.F.W. honor guard members. He enjoyed fishing, bowling and playing cards. He also loved to collect Allis Chalmers tractors. LaVerne is survived by his wife Shirley of Remsen; three children, Mike (Karen) Jaminet of LeMars, IA, Tom (Heidi) Jaminet of Remsen, Kristi (Dan) Gross of Tekamah, NE; 10 grandchildren, 6 great-grandchildren; sister-in-law, Shirley Heuertz of Denver, CO; brother-in-law, Marvin (Donna) Pick of Marcus, IA. He was preceded in death by his parents, his siblings, Rose (Andy) Schmitz, Edward (Helen) Jaminet, Raymond (Martha) Jaminet, Francis (Phylis) Jaminet, Harold (Joan) Jaminet, Mary (Robert) Hagey, Lorne (Marion) Jaminet and Florence (Andy) Lathrum; In laws, Joe (Marie) Heuertz, Mary Jane Heuertz, Theresa (Leo) Freking, Rosemary Pick and Frank Heuertz. Casket bearers will be, Chanz Jaminet, Brittany Jaminet, Matt Gross, Tim Majeres, Shantel Fancher and Amanda Jaminet. Honorary bearers will be, Erin Gross, Caty Gross, Christine Majeres and members of the Knights of Columbus and Catholic Order of Foresters. To send flowers or a remembrance gift to the family of Robert LaVerne Jaminet, please visit our Tribute Store. Visitation with family present will be 4-7 p.m. Thursday. There will be a rosary by the Knights of Columbus and Catholic Order of Foresters and vigil prayer service all at 5 p.m. at Fisch Funeral Home & Monument in Remsen. "Email Address" would like to share the life celebration of Robert LaVerne Jaminet. Click on the "link" to go to share a favorite memory or leave a condolence message for the family.